v2.00 of SEB Lems is now out, this is a very sharply updated version of the pack where a vast majority of levels have gone through backroute fixes, music track swaps and sweeping changes to prepare for the new format release (I made ceiling fixes for example). I assume this pack has now been played by the majority of forum users so I have made fixes accordingly. I worked on fixing this pack in the old formats while making preparations for the new format conversion so there will be features that are apparent of this like ceiling fixes. I felt it was easier to do it this way. While I have tried very hard to make sure replays are preserved, there are a handful of levels where all of the replays will be broken so be sure to check your replays for solvability after upgrading! Apologies for any inconvenience regarding broken replays, in the majority of cases it means your solution was a back route though. This will be the LAST update made to the old format of SEB Lems in any case. I am now entirely moving over to the NeoLemmix new formats and I will no longer be supporting this pack in old format and will move to work on the New Format version of SEB Lems. Feel free to still report any functionality problems with the pack but it will be my decision whether I choose to fix them or not (most likely I will if it's something quick to fix though). v2.00 changelog - this is a huge update so lots of information in here. Level swaps are further down in the spoiler tag. 30 - One Way Arrows fixed. 30-MegSEByte Hard Drive - backroute by IchoTolot and Nessy fixed, ceiling added on upper-left. 99 Ways to Die - One Way Arrows added under trapdoor. Aaaahhhh Real Monsters - Time Limit 7:00 + back route fix. Across the Wing Fortress Deck - Talisman removed. Are You Really The Devil? - Added steel on hanging ball. Big Top Drop - Talisman added: Save 91 or more lemmings. Birth of an Empire - Now Save 100%, Nessy's solution adopted. Futuristic Climber Zone - Arty's backroute fixed. Golden Round - Trapdoor moved to right slightly, steel and traps added to left of trapdoor, increase save requirement by 1 to 37. Harvey Haddon Sports Pyramid - One Way Arrows added, ceiling doesn't need fixing. Here Comes The Rapture - Steel added under "Death"
Hot For High Times - 3:00 Time Limit, Arty's solution adopted. I'd Give You Anything - Level changed completely, no cloners, 1 fencer added, solution changed to prevent horrible backroutes. I'd Never Make A Level About You - IchoTolot's solution adopted, -1 Basher from skillset, flamethrower over lava raised 1 pixel. In Between Worlds - Steel added in top right section to stop top left being back routed. Never Let Me Down - added steel to ceiling above spike trap. Rick-afinity - added One Way Arrows to Rick faces near exit. 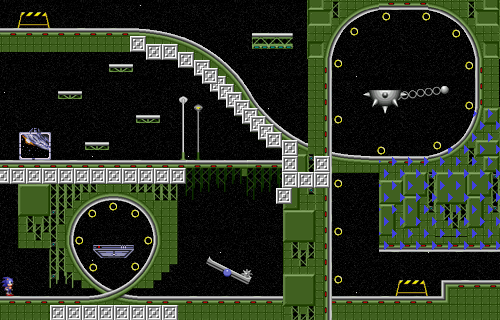 Running Circles Around The Moon - back route fix, added spike trap from Snow tileset. SNAKE! - Release Rate now locked at 70 to increase difficulty. The Outbreak - backroute by Arty fixed, fixed ceiling on upper-right of level. Up and Down and All Around - backroutes by Arty, Icho, josh and Nessy fixed. Level moves - please use this to update your replay files with the correct level numbers. First code displayed is the level position in any version 1 of SEB Lems (since release) and the > points to where it has moved to in v2.00. - Fixes an instance of copyright infringement on YouTube discovered by Colorful Arty, I have removed usage of inmyarms from the nxp. This track will remain in the music pack because I've just reprogrammed the nxp to not use it rather than re-distribute the entire music pack minus this file. Thanks to Wafflem for the main menu background! Thanks to Gronkling for allowing me to use items from his cyber tileset in the Scrap Brain tileset. -175 levels across 9 different ranks. -Unrequited: A rank consisting of levels by Wafflem from Dullstar's "Bits of levels you can finish" topic. Wafflem is co-creator of all levels in this rank. -Deep Cuts: A rank of 15 levels consisting of levels which were rejected from the main pack. Still interesting levels though. -nearly 60 different tilesets used throughout the pack. Star Light - Another zone from the Original Sonic the Hedgehog. This zone is more Sonic friendly and less lemming friendly! Bittersweet (20 levels) - Still easy, sometimes less skills. Tricky difficulty. Revolution (20 levels) - Taxing Difficulty, precision increase. Get on the Revolution! MegSEBytes (20 levels) - based on the collab pack by Wafflem and I, this contains 18 of the 30 levels from the pack, the other 12 are mixed in with the main difficulty ranks above. Whoever is named first in the author field designed the level terrain, whoever is named second inserts the objects, makes the solution, skillset and names the level. Containing 2 levels exclusive to SEB Lems. Unrequited (20 levels) - A rank consisting of levels by Wafflem from Dullstar's "Bits of levels you can finish" topic. Wafflem is co-creator of all levels in this rank. Deep Cuts (15 levels) - Rejected levels from the main pack. Heck yes! I will start my LP of this pretty soon! First upload should either be Friday or Saturday! A huge congratulations to Flopsy for finally releasing SEB Lems after months of hard work and testing! It has been a great pleasure working with you on testing and all the collab levels that we have both done. Thank you for making this pack, and thanks as well to all the other people (including SEB) who helped made this pack possible! Hoo boy. Just from a cursory playthrough of the first 3 levels, I feel like this is gonna be another one where I can't clear out rank 2. Oh well, I'll see what I can do. Looks fun anyway! This is a small fix to Rapture 10 which has become unsolvable in v1.8. Everyone will have to re-download sadly. Sorry about this. Hopefully not many people have got to this level yet since it was detected early enough. Thanks to IchoTolot for spotting this bug. Congratulations Flopsy on completely your pack , and your Sonic inspired graphic sets are amazing by the way. I have just downloaded v1.81 and I'm hyped to try it out when I finish working today, but so far I just want to say that I love the rank images. Really creative . Ok, this might be due to the tileset mixing error message I sometimes get. I also get this error in Triangular Race Through Space (Deep Cuts 2). Are you able to load the Wing Fortress levels GigaLem, if so this error message is due to the intense tileset mixing I believe. Finally started playing through the first two ranks (stopped at Bittersweet 18). Excellent levels! I have attached my replies. I don't think I backrouted any of them, but I think I might have done some levels unintentionally. - I found Back 2 Paradise to be an interesting level because I have never played a level where the custom music had lyrics. I liked it very much . - I love how some of these levels are inspired by 3D Lemmings levels, although I'm not sure which level inspired Party In My Head. - I think there is a bug in Welcome To Star Light Zone! as I was able to mine and bash in the opposite direction of the arrows. Don't know if that was intentional, just wanted to let you know. - My favorite so far is Candy Floss Bonkers. That one was really tough to figure out, but brilliant solution! Thanks for the replays Nessy. You've worked hard on getting 100% on a lot of these and you've earned a lot of the Talismans for these levels just by playing as conservatively as you have! These are the ranks where backroutes are very rare, I wouldn't consider any Paradise solution a backroute to be honest, it's just a do as you please rank and any solution is fine. You didn't find any glaring backroutes so far. Glad some people are enjoying the nod to L3D levels, just look out for the L3D monikers and the level is either an entirely 2D level from L3D which was remade in SEB Lems or a 3D level from L3D which has been reimagined in 2D. Party in my Head is inspired by "Let the Race Begin" from L3D, it's an Army level which had 4 trapdoors. It's not identical to this level but some of the left hand obstacles were taken from this. Interesting bug in Star Light, I'll have to investigate this further, thanks for pointing it out! I'm not really sure how I can fix this then, I guess it's a good job that "So It Resumes" was moved to the Deep Cuts rank because it used to be a Stormy rank level. I'm puzzled at why Ocean World is struggling to load, it does use tileset mixing but it only has a custom inserted background which gives the black background over the ocean backdrop. Are you able to tell me whether you get an error message or not GigaLem? If NeoLemmix just closes suddenly then it's the "Can't allocate DIB handle" message most likely. I also found that not scrolling through the levels really fast or using F2 for level select would possibly make this crash not occur also. Note: if you are currently playing through SEB Lems and have not beaten these ranks then there will be spoilers obviously. Rick Astley doesn't want to give me up yet. Some of those levels look really nice. The starlight rollercoaster looks quite cool and tricky me thinks. I finished all of the levels.